Central Selection Board of Constable(CSBC) released a list of Finally selected candidates for the post of Constable in Bihar Police againest Advt. 01/2017. CSBC conduct physical test(PET) from 19.02.2018 to 27.03.2018. 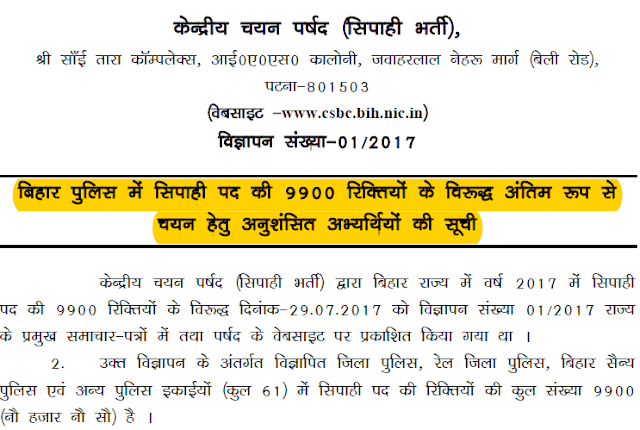 Candidate who selected for post of constable in Bihar Police are listed in result pdf, link given below. Click here for List of Finally selected candidates for the post of Constable in Bihar Police.